Yanique Woodall’s first venture into the PR industry was with a small firm called CS Marketing based out of New York City, which boasted a roster of promotional clients, including restaurants and startup businesses. That experience taught her a number of things. In addition to learning how to create a marketing program, she also learned how to be extremely creative, since most of the businesses she worked with were on a shoestring budget. Most of all, she learned how public relations could be integrated into any marketing program. From there, Woodall went to another small firm in New Jersey called Rachel Litner Associates, which worked on consumer products. There, she learned the beauty of developing communications plans focused on today’s consumer. Woodall says, “It was more than just making sure that your product was on the page, but also how do you tell the story around the product.” That was also her first experience focusing on female consumers and their buying habits and thought processes. After other stops, Woodall landed her first corporate role with Avon Products, Inc.
Woodall explains, “Avon was my first push with retail PR — that’s where all of the magic and excitement worked for me, and that’s really where I began my retail experience.” Although Avon is a direct sales company, at the time Woodall joined it was doing its first retail venture in department stores, including JCPenney and Sears. Woodall was lucky enough to work on that initiative. As a PR executive for a Fortune 50 company, she’s seen the industry change dramatically over the years, from a shortened news cycle and fake news to online shopping and social media — all of which can have a dramatic effect on a company’s brand. “The pivotal moment for me was understanding how communications wasn’t this siloed division within an organization, it was something that needed to be woven into many facets of the organization,” Woodall said. Although Hofstra University didn’t have a public relations program at the time, Woodall and one other student would meet in that professor’s office at 8 a.m. every morning for “independent studies” to learn about public relations. When Woodall got to Avon Products, Inc., that same professor contacted her and asked if she would like to teach. Woodall was working 14-hour days, so she knew she couldn’t. But one day she mentioned it to her direct supervisor, who told her to do it — that they could work out the scheduling details. Woodall says, “My supervisor told me, ‘Manage your day. You’re a strong manager. I know you’re an advocate for education — you talk about it all the time. Try it out, and we’ll work the rest out later.’” So she did. Yanique Griffin-Woodall is Vice President, Enterprise Public Relations at 1-800-FLOWERS.COM. She is responsible for leading the enterprise public relations division and external agencies in strategic integration of consumer communications programs to support 1-800-FLOWERS.COM and its subsidiaries. She leads the public relations strategy and execution for business-to-business and trade focused programs, is responsible for global reputation management strategy and serves as the senior communications advisor as part of the Leadership Team. Woodall joined 1-800-FLOWERS.COM as director of public relations, consumer floral brand in 2006. In this position, she directed the public relations department in strategic integration of public relations programs for the consumer floral brand to support the sales team, marketing and new business initiatives. 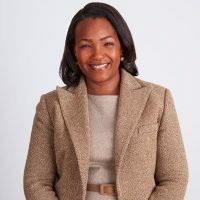 Previously, she worked for Avon Products, Inc., and was responsible for the marketing and communications for the company’s flagship and first retail venture in New York City. Woodall was also senior manager, corporate communications group at Fujifilm, USA, Inc. Since 2003, Woodall has been an Adjunct Assistant Professor in Hofstra University’s School of Communi­cations. In addition, she holds an Adjunct Faculty position with George Washington University. She has earned a bachelor’s degree in communications/mass media studies from Hofstra University and a master’s degree in corporate and public communications from Seton Hall University. Woodall has been recognized as Long Island Business News Top 50 Most Influential Women (2009) and PR Week Top 40 Under 40 (2012) . Also, she has published several public relations industry articles in publications, including PRSA’s Public Relations Tactics Magazine and PR Week.